By default Gmail Addon Panel appear on right side of desktop browser. On Gmail mobile app, it is appear at the bottom of message. If Gmail Addon Panel does not appear on your Gmail, your G-Suite admin disable the feature. Ask your G-Suite admin to enable Gmail Addon. From the side bar drawer, go to Setting screen and then select Sugar Setting. In the Sugar Setting screen, click logout. Does Yathit support multiple clients login? 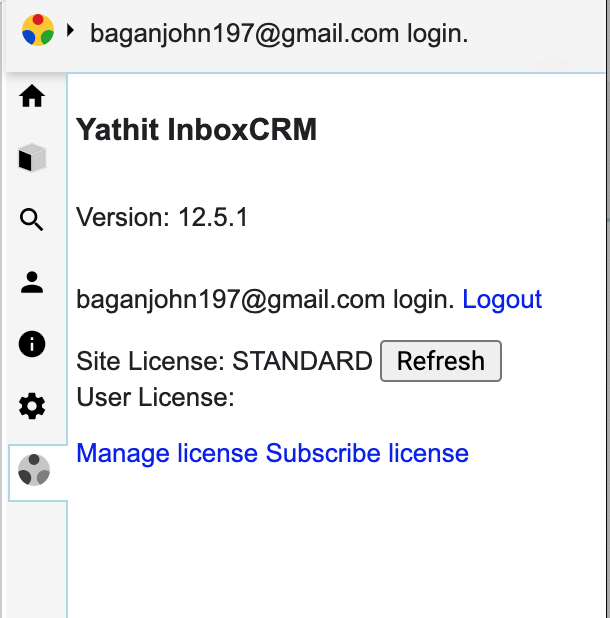 Yes, Yathit Chrome Extension and Yathit: SuiteCRM Mobile App does not have limitation. However, depending on your SugarCRM setting that prevent from logging in to multiple clients to detect simultaneous login from different ip as plausible fraud. How to select related fields? Some of the record fields are related record to other modules. When you edit related record fields, Yathit will suggest possible related record. Select the suggested related record item to set the field. Entering plain text will not work. How to show or hide fields? You can customized which fields to show or hide in record detail view. To do that, click overflow menu in the record detail view and select 'Fields...' menu item. What is Developer Mode (dev mode) and how to turn on? Developer Mode introduce additional functionality mostly are for logging, viewing raw data, preparing bug report, viewing performance statistic and enabling upcoming features. You can turn on Developer Mode in App Setting.